How It’s New York: Ashley Davis can often be seen at events around New York, including “Pen, Paper and Palate” and the Irish American Writers and Artists’ Salon. She’s performing at Joe’s Pub this week. 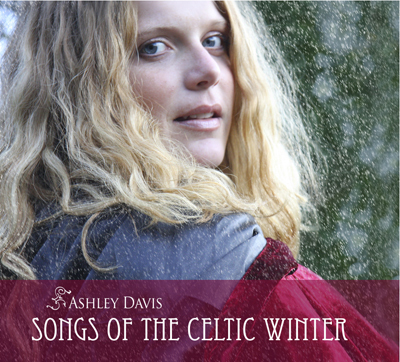 How It’s Irish: Ashley’s new CD Songs of the Celtic Winter, and it includes Irish poetry, with Irish instrumentation. Catch Songs of the Celtic Winter before winter ends: Thursday, Feb. 23 at Joe’s Pub! Davis recorded this album in New York, Lawrence, KS, and San Francisco and now will perform numbers from the CD at Joe’s Pub (New York, NY) on February 23, 2012 at 7:30 pm. The album is laden with harp, mandola and a range of acoustic instruments and vocal layers that creates and Davis’ signature sound. Davis has been profiled on The Today Show, named one of the Irish Echo newspaper’s “Top 40 Irish Under 40,” performed original music on film soundtracks and has lectured at U.S. colleges and universities. Davis has toured in Lord of the Dance as the vocal soloist, has worked with Paddy Maloney of The Chieftains and has toured with Moya Brennan of Clannad, while developing her own solo and recording career, selling out shows internationally and in her adopted hometown of New York City and now Lawrence, KS. Joe’s Pub is part of The Public Theater, located at 425 Lafayette Street between East 4th and Astor Place in New York City’s East Village. For more information and to order tickets, please go to www.joespub.com.